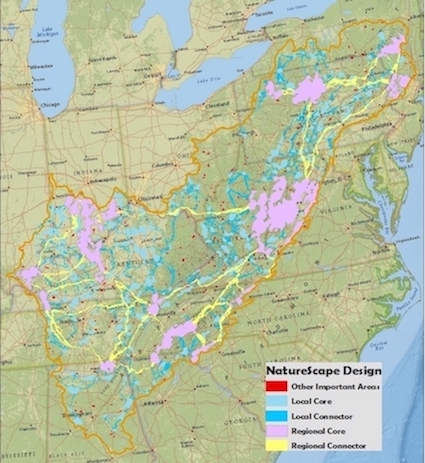 The Appalachian NatureScape Design incorporates and models newly developed data and information from all Appalachian LCC funded research projects as well as key existing datasets from partners to produce a series of maps that integrate aquatic connectivity with terrestrial significant habitats to guide conservation planning and decision making. Well-connected landscapes are necessary to sustain many of the natural and cultural resources important to the Appalachian region today and into the future. If large connected areas are to remain and be resilient to impending environmental changes, it will require a collaborative effort involving many organizations and reaching across state boundaries. Conservation Planning, a process of spatially identifying and prioritizing lands and waters important for functioning ecosystems and biodiversity, is well suited to address the many large-scale biodiversity challenges facing the region and lead to conservation outcomes that link pristine and natural lands into an interconnected landscape for plants, animals, and humans. Where planning is the process, Conservation Design is the product. It can be a series of maps or data layers that illustrate the location of key focal landscapes and priority resources, or combined into decision support tools that can inform managers and conservationists about the quality, quantity, and location of habitat needed to protect biodiversity. The Design helps to prioritize both natural and socio-ecological systems as well as actions that hold the greatest promise for the protection of biodiversity. In Phase I of the Appalachian NatureScape Design, a research team out of Clemson University used super-computing technology and Marxan software (the most widely used conservation planning tool in designing networks of terrestrial, aquatic, and marine conservation areas) to identify ecologically significant habitats and natural resources that are connected across the landscape and will be resilient to future threats. Researchers identified five conservation elements covering critical ecological processes and patterns across the Appalachian LCC geography. These elements include large interconnected regions (cores) as well as broad corridors that connect them (connectors). Other smaller areas that are likely to contain key natural resources than their size would suggest were also mapped. Areas identified in the initial effort can be viewed and the data downloaded from the Appalachian LCC Conservation Planning Atlas. Since cultural resources are an additional critical piece of conservation design in the Appalachians, a conceptual framework is being developed for mapping cultural resources across the entire geography and will be integrated in a future iteration of the NatureScape. The success of this or any conservation planning and design enterprise is dependent on human communities. A successful conservation plan provides public land managers, NGOs, and private landowners the ability to incorporate landscape data into their own local land use decisions. In order for these organizations and individuals to find plans useful, the plan must be dynamic and well informed by stakeholders. The LCC system provides a great model for bringing these parties together to form a unique and comprehensive conservation vision across the region. View a video presentation by Paul Leonard of Clemson University, which provides an overview of the NatureScape Conservation Design, conservation elements, and major deliverables. This next video presentation by Paul Leonard focuses on phase 2 of the NatureScape Conservation Design, where Clemson researchers and technical teams will refine phase 1 by selecting metrics to fit into the conservation design framework, integrate aquatic and cultural resource components, and discuss major threats and determine best scale to examine integrity. This presentation by Dr. Daniel Hanks shares information on the method used to derived the aquatic condition score used in Phase II of the LCD. 2017: Locating Stable Sites: Climate Refugia in the Southern Appalachians Nelson, Alexander Harper, Published August, 2017 All Theses. 2723. 2014: High-throughput computing provides substantial time savings for landscape and conservation planning. Paul B. Leonard, Robert F. Baldwin, Edward B. Duffy, Donald J. Lipscomb, Adam M. Rose. Landscape and Urban Planning 125 (2014) 156–165.